A reviewer on Amazon compared Russo to John Irving and Robertson Davies, and while I can’t entirely see the Irving connection (though A Widow for a Year did grow on me), perhaps one should check out Davies? Oh, and check out Chris Bohjalian. I’ve missed this, but apparently Waterstone’s want to take over Ottakars. The deal was halted because of investigation by The Competition Commission, but now the commission has come to the conclusion that the deal’s ok. It’s not going to be a problem, apparently, because bookseller’s are meeting such tough competition from supermarkets anyway. Ms. Bookish links to an article in The Guardian which has me fuming, especially at the last sentence, proclaimed by Diana Guy who led the commission’s inquiry: “We felt that the big publishers can probably look after themselves.” Yes, well, I’m not sure anyone is worried about the fate of the big publishers. What everyone, including the big publishers, but excepting the commission, is worried about is the possibility of publishing titles with a small or unknown market if the only avenue for sales is the bookshelf at the supermarket. Don’t get me wrong, I love browsing in Waterstone’s and Ottakar’s is, after all, just another chain, but so far there’s been a point of going to both, because they’ve had different titles on their shelves, after a merger they’re all going to look the same. So it turns out aardvark is not the first word in the dictionary. Not by a long shot. Not THE dictionary, anyway. The OED has several entries preceeding aardvark. I assume most other dictionaries would also have “a”, as in “a word”, as an entry, but the OED has other stuff also, some obsolete, being the OED. Anyhoo, I’ll let the aardvark keep the honour of being top of the list for the time being, since it’s the first creature – South African, in case you didn’t know – in the dictionary (also THE dictionary). Following hot on its heels (possibly also literally, though you’d have to check with a zoologist) is “aardwolf”, also South African (blame the Dutch). So now we know. I’ve been tidying the bookblog. A few days ago (it may be weeks by now, actually), I decided I really needed a category for book-related posts. I could just put them in this blog, obviously, but I like being able to include them in the bookblog, I feel they belong there somehow. Still, they obviously don’t belong under a specific author, so hence the new category “Aardvark – on books in general, booklinks, bookmemes and such”. Aardvark because it’s the first word in the dictionary and so likely to keep the category on top of the alphabeticised list. Today I decided to do something about the stupidly long category list I’ve aquired by reading books by too many different authors. It’s not a problem as such, obviously, but MT creates one file with the individual entry and one for the category archive and for all these 1-book authors those two files were basically the same. So I created a one-hit-wonder category for all those books that, for some reason or another, are likely to be the only entry on that specific author for the foreseeable future. It’s not a reflection on the quality of the book, at least not necessarily, in some cases the author simply hasn’t written any more books (like Sylvia Beach), in some cases I mean to read them, but not any time soon (like George R.R. Martin). Sometimes, of course, it’s because I didn’t much like the book, but those are actually the exceptions rather than the rule. It should be obvious from the entry which category the book in question falls into. The question now, of course, is: What is the second word in the dictionary. I need to get the category listing moved up from the O’s. Conversation between Stephen Fry and J.K.Rowling. Has to be good. 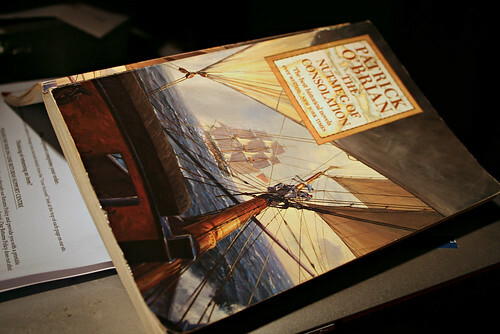 I’m rereading O’Brian – about half-way through now. Once I’m done with that, I think I will probably join the worthy people at bookcrossing in an alphabeth challenge, though we are quite far out into 2005 ;) I will start a list here, anyhow, and then see how well I can do.. Though why I feel I need to add more books to my tbr pile, I couldn’t tell you. Continue reading What am I doing?